It’s thin, squishy, and shaped slightly like a human. It even moves a little bit. The unusual creature was found “floating along the shore” at an undisclosed beach in China on July 9, 2018. Most locals were “scared to approach,” according to the Daily Star, but as is usually the case, someone eventually rose to the challenge. In the video, a man holds up the spongy humanoid by its “head” while its “feet” sway back and forth. It’s certainly an odd thing to look at. But what is it? The Hidden Underbelly, who shared the video, at first suggested it “could be a new species of sea life or [a] mutated starfish.” Many in the comments wondered the same, questioning if perhaps Fukushima radiation could be the culprit. 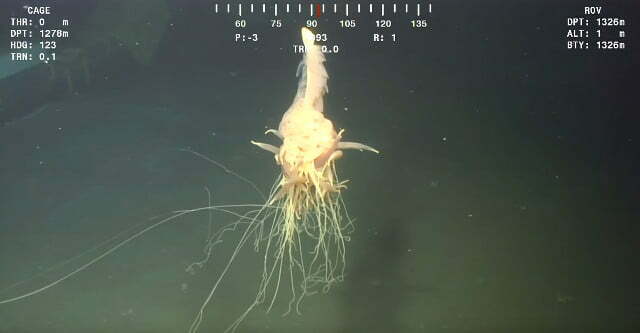 Regardless, some of the weirdest creatures on Earth live in the sea. In fact, according to MIT News, simple sea sponges may have been one of the first animals to ever exist on our planet, if not the first. Previous PostPrevious Jason the Horse: Is He A Horse In Human Form?